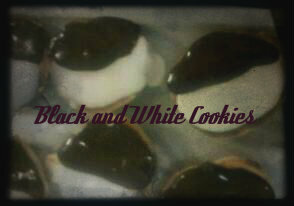 So, taking on the challenge to create perfect bagels and black and white cookies was, well, challenging. Let’s start with bagels. Once I tell someone that I have made bagels, they ask, “did you boil and then bake them?” and I think my face contorts into a funky mess as I reply, humbly, “Yes, of course!” It always comes to a surprise to me that people even have to ask. How else are bagels made? How else do you get that chewy texture? Have they heard of people just simply baking bagels like they would anything else? I guess so. I just can’t even imagine it. 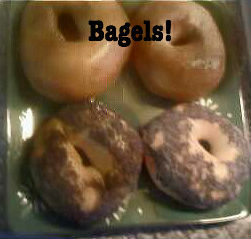 So, yes, I boiled and then baked the bagels. I think they came out great, especially with the addition of poppy seeds. I made these because, believe it or not, I met someone who had never even heard of them until I brought them up. Also, because I love the memory I have of my sister and I sharing them. She got the vanilla half and I got the chocolate half. Perfect. This entry was posted in bagels, black and white cookies, chocolate, chocolate chips, cookie dough, cookies, dessert, dough, poppy-seeds and tagged Baking. Bookmark the permalink. Thank you for some other informative web site. The place else may I get that type of info written in such a perfect approach? I have a project that I am just now working on, and I have been at the look out for such information. I am glad you like the site; thanks for stopping by!